Windows Startup Folder Protection - Anytime you start your computer, Windows initializes all items included in Windows Startup. Some harmful applications use this folder to automatically start themselves upon Windows start. Spyware Terminator 1.6 Real-Time Shield extended the protection to cover also this folder to enhance protection of your computer against spyware attacks. Personalize Your Scan Settings - This feature allows you to further personalize items that will be scanned within the spyware scan. This way you can opt to scan cookies, invalid items, unreadable files and alternate file streams. Optional Cookies Scan - Now you can enable or disable checking cookies during the spyware scan. 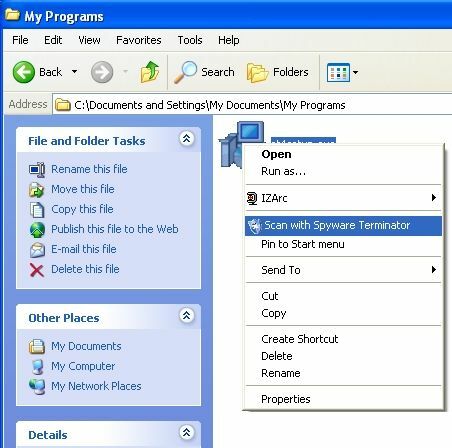 Integration of Spyware Terminator installations into Spyware Terminator Corporate Edition - Do you have Spyware Terminator installed on more computers in your office and now you've decided to manage them centrally using Spyware Terminator Corporate Edition administrator tool? No problem, now you can easily integrate previously installed Spyware Terminator into Spyware Terminator Corporate Edition witthin the General Settings. On-demand scan within the right-click context menu - Don't you want to scan your computer in order to check one suspicious file? Now you can check a single suspicious file by right-clicking it and selecting the "Scan with Spyware Terminator" option within Windows Explorer. Scheduled scan count-down - In case that Spyware Terminator was not able to run scan in scheduled time because it was shut down, Spyware Terminator notifies user upon next start of Windows of the opportunity to run the scan now. 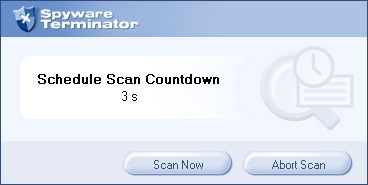 If the user does neither confirm nor deny the option, scan will automatically start after the count down. Unreadable files detection - Some kinds of spyware pretend that their files cannot be read to keep out of antispyware programs. Spyware Terminator can reveal this trick - if it during the scan finds a file that cannot be read, it notifies the user. Info about limited user - This new feature notifies user with limited rights when he/she attempts to perform an operation (removal, moving a file to quarantine) with file to which this user has a limited access.